Ayooq, A., Alem Tabriz, A., Javani, A. (2015). Virtual manufacturing cells scheduling considering lotstreaming and sequence dependent setup times. Journal of Industrial Engineering and Management Studies, 2(1), 61-73. A. Ayooq; A. Alem Tabriz; A. Javani. "Virtual manufacturing cells scheduling considering lotstreaming and sequence dependent setup times". 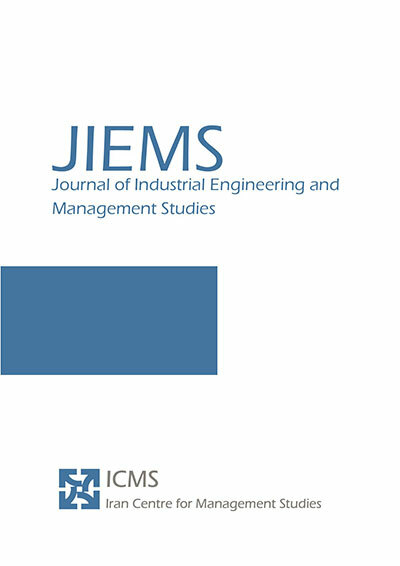 Journal of Industrial Engineering and Management Studies, 2, 1, 2015, 61-73. Ayooq, A., Alem Tabriz, A., Javani, A. (2015). 'Virtual manufacturing cells scheduling considering lotstreaming and sequence dependent setup times', Journal of Industrial Engineering and Management Studies, 2(1), pp. 61-73. Ayooq, A., Alem Tabriz, A., Javani, A. Virtual manufacturing cells scheduling considering lotstreaming and sequence dependent setup times. Journal of Industrial Engineering and Management Studies, 2015; 2(1): 61-73. 1Department of Industrial Management, Shahid Beheshti University, Tehran, Iran. 2Shahid Beheshti University, Tehran, Iran. 3Kar Higher Institute, Qazvin, Iran. In this paper, a new mathematical model for the problem of job scheduling in virtual manufacturing cells (VMC) is presented to minimizing the completion time of all jobs. Sequence dependent setup times of machines is considered and lot-streaming is possible. In Virtual manufacturing cells, each job has a different processing path and there is a set of machines for processing each operation. There are multiple machine types with several identical machines in each type locating in different locations in the shop floor. In this type of system, the cells are not physical and Machines can be shared between the cells. In Mixed-integer nonlinear programming model presented, the scheduling decisions involve assigning a machine to each operation, the start time at each operation, the start time of machines and sub-lot sizes of each job. Some test problems have been generated to demonstrate the implementation of the model and solved by Lingo. Allahverdi, A., C. T. Ng, T. C. E. Cheng, & Kovalyov M., 2010. “A Survey of Scheduling Problems with Setup Times or Costs”. European Journal of Operational Research 187 (3): 985–1032. Arkat J. & Ghahve H., 2014. “Scheduling of virtual manufacturing cells with outsourcing allowed”. International Journal of Computer Integrated Manufacturing: 1079-1089. Baker K.R. 1995. “Lot streaming in the two-machine flow shop with setup times”. Annals of Operations Research 57, 1-11. Chen J., & Steiner G. 1998. “Lot streaming with attached setups in three-machine flow shops”. IIE Trans 30: 1075–1084. Drolet JR., 1989. “Scheduling virtual cellular manufacturing systems”. PhD thesis, Purdue University. Glass C. & Potts C., 1998. “Structural properties of lot streaming in a flow shop”. Mathematics of operation research. Hamedi M., Esmaeilian G., Ismail N., Ariffin M., 2012. “Capability-based virtual cellular manufacturing systems formation in dual-resource constrained settings using Tabu Search”. Computers & Industrial Engineering: 953–971. Irani SA., Cavalier TM., & Cohen PH. 1993. “Virtual manufacturing cells: Exploiting layout design and intercell flows for the machine sharing problem”. Int J Prod Res 31(4): 791–810. Kalir A., Sarin S., 2002. “Constructing Near Optimal Schedules for the Flow-Shop Lot Streaming Problem with Sublot-Attached Setups”. Journal of Combinatorial Optimization: 23–44. Kannan VR., Ghosh S., 1996. “Cellular manufacturing using virtual cells”. International Journal of Operations and Production Management. Kannan VR., 1997. “A simulation analysis of the impact of family configuration on virtual cellular manufacturing”. Production Planning and Control: 14–24. Kesen SE., Das SK., & Gungor Z. 2010. “A mixed integer programming formulation for scheduling of virtual manufacturing cells (VMCs)”. Int J Adv Manuf Technol 43(5–8): 665–678. Kesen SE., Das SK., & Gungor Z. 2010. “A genetic algorithm based heuristic for scheduling of virtual manufacturing cells (VMCs)”. Comput Opns Res 37(6): 1148–1156. Kesen E. & Gungor Z., 2011. “How important is the batch splitting activity in scheduling of virtual manufacturing cells (VMCs)?” International Journal of Production Research: 1645-1667. Kesen SE., & Gungor Z. 2012. “Job scheduling in virtual manufacturing cells with lot-streaming strategy a new mathematical model formulation and a genetic algorithm approach”. Journal of the Operational Research Society, 63, 683–695. Ko K-C , Egbelu PC., 2003. “Performance comparison of static and dynamic cellular manufacturing system”. In: Proceedings of the first group technology / cellular manufacturing world symposium.p.1–6. Mak K., Lau J., & Wang X. 2002. “Production Scheduling and Cell Formation for Virtual Cellular Manufacturing Systems”. Int J Adv Manuf Technol:144–152. Mak K., Lau J., & Wang X. 2005. “A genetic scheduling methodology for virtual cellular manufacturing systems: an industrial application”. International Journal of Production Research: 2423-2450. Mak K., Lau J., & Wang X. 2007. “An ant colony optimization algorithm for scheduling virtual cellular manufacturing systems”. International Journal of Computer Integrated Manufacturing: 524-537. McLean CR, Bloom HM, & Hopp TH. 1982. “The virtual manufacturing cell”. Mak K., Ma J. & Cui X., 2011. “Integrated Multi-period Production Scheduling and Cell Formation for Virtual Cellular Manufacturing Systems”. Engineering Letters. Nomden G. & Zee D., 2008. “Virtual cellular manufacturing: Configuring routing flexibility”, Int. J.Production Economics: 439–451. Nomden G., Slomp J., Suresh c., 2006. “Virtual manufacturing cells A taxonomy of past research and identification of future research issues”, Int J Flex Manuf Syst: 71–92. Rezazadeh H., Ghazanfari M., Sadjadi S., Aryanejad B. & Makui A., 2009. “Linear programming embedded particle swarm optimization for solving an extended model of dynamic virtual cellular manufacturing systems”. Journal of Applied Research and Technology: 83-108. Saad SM., Baykasoglu A., GindyN NZ., 2002. “An integrated frame work for reconfiguration of cellular manufacturing systems using virtual cells”. Production Planning & Control:381–93. Slomp J., Chowdary V., Suresh C., 2005. “Design of virtual manufacturing cells a mathematical programming approach”. Robotics and Computer-Integrated Manufacturing: 273–288. Vakharia AJ., MoilyJP., HuangY.,1999. “Evaluating virtual cell sand multi stage flow shops”. International Journal of Flexible Manufacturing Systems:291–314.